Arrival at the Airport of Maumere (or Ende). Our english speaking guide will pick you up at the airport and will take you directly to your hotel in Moni. Dinner and Overnight at Kelimutu Moni Eco Lodge. In the early morning at 04.00 am the car takes you to the three colored lakes of Kelimutu, one of the most spectacular and mysterious sights in Indonesia. You will witness a beautiful sunrise. Then you return to the hotel and after having breakfast you continue the trip to Ende. On the way several stops will be made i.e. in Nangapanda or the blue pebble beach. Lunch will be provided in Ende and in the afternoon you will arrive in Bajawa. Dinner at Ditos restaurant and overnight at Villa Silverin or Happy-Happy hotel. After breakfast you visit the local market in Bajawa, then continue to Bena – an ancient Ngadanese village above 1.5 hours away from Bajawa. Experience the unique way of life with the traditional houses and the ceremonies that are still authentic in a long-preserved tradition. After that you continue to Aimere, the centre of “Arak”-production. In the afternoon you arrive in Waewole. Dinner and overnight at Mbalata Beach Cottage -Waewole. You start your day with a horse-riding and trekking tour leaving from Mbalata Beach to Watu Susu Rongga. This trip leads along the beautiful beach and through an exotic savannah and takes around 4 hours. You will spend another hour trekking to see the megalithic tombs where local heroes of the Rongga tribe and their relatives were buried during the Komba war, at ‘Watu Susu Rongga’: two massive boulders that form the shape of a woman’s breast. It is a place where the tribesmen perform traditional rituals. Afterwards you first return to the hotel and take lunch before you continue to Ruteng. Dinner at local restaurant and overnight at MBC Susteran guest house, Ruteng. In the morning you visit a spectacular twotier waterfall called Tengkulese. 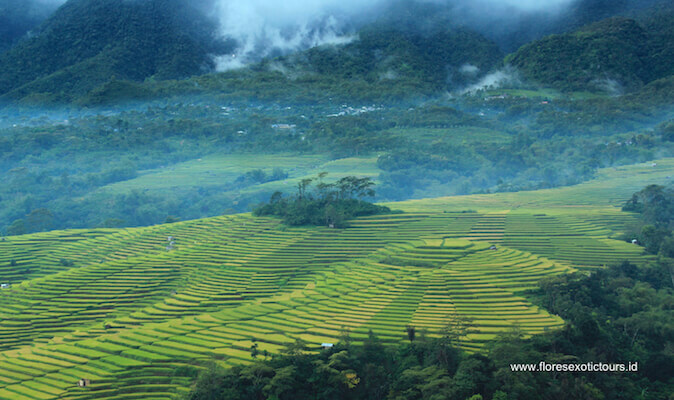 To reach this beautful sight near Ruteng you will do a one-hour hike passing rice paddies, a traditional small village and pure nature. Once arrived at the waterfall you can spend your time swimming and relaxing in this stunning surrounding. After returning to the car you continue to Cancar to see the unique Lingko rice field, circular terraces arranged like a spider web. In the afternoon you arrive in Labuan Bajo. Dinner and overnight at Puri Sari Beach Hotel. After breakfast at your hotel we take you to the pier of Labuan bajo where a boat there will leave for the island of dragons, Rinca. Once arrived at Rinca Island a trekking tour of approx. 2 hours awaits, that is the best opportunity to see dragons and their prey, passing the dragon nests and out into the sunshine across an exposed savannah studded with lontar palms. Reaching the top of the exposed slopes you will be rewarded with breathtaking views. After returning to your boat lunch will be provided on board while you proceed to Bidadari Island or Kelor Island for swimming, snorkeling or relaxing at these paradisiac beaches with crystal clear water. In the afternoon you sail back to Labuan Bajo. Overnight and Dinner at Puri Sari Beach Hotel. After breakfast you go for a morning excursion to visit to the Batu Cermin Cave before we provide transfer to the airport for you to catch the flight to Denpasar. alcoholic Drinks , personal expenses and Tipping. Remarks: All our trips can be organized tailor-made at request.